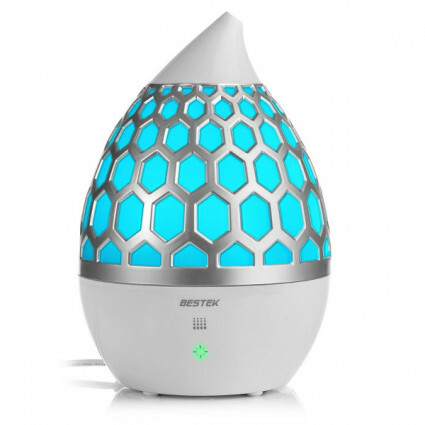 BESTEK ultrasonic essential oil diffuser has 4L large capacity that can provide aroma mist for the whole home. Multiple colors and adjustable mist modes make the air humidifier smart and friendly to help relief stress and cheer you up. 4L large capacity can provide ideal mist coverage for the whole home and can keep humidifying for 11H long. 7 changing colors fit for various occasions; 3 adjustable mist levels meet your different needs. BPA-free and environmental friendly materials without chemicals; auto shut-off function ensure safety when the diffuser is empty. Aroma oil mist is fragrant and healthy to help calm your mood and relax your body; moisture mist can keep air fresh against alleviate cough/flu congestion and protect your skin.